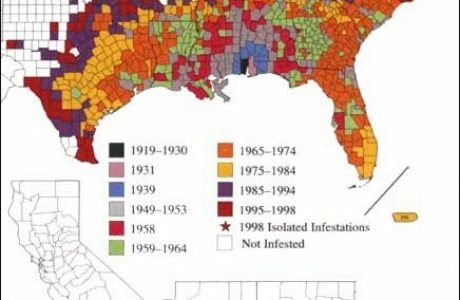 South American fire ants are on a rampage and have blazed their way through a growing number of southern U.S. states. Now, scientists are seeking a way to fight the deadly insects that are destroying crops and terrorizing small mammals as well as humans. 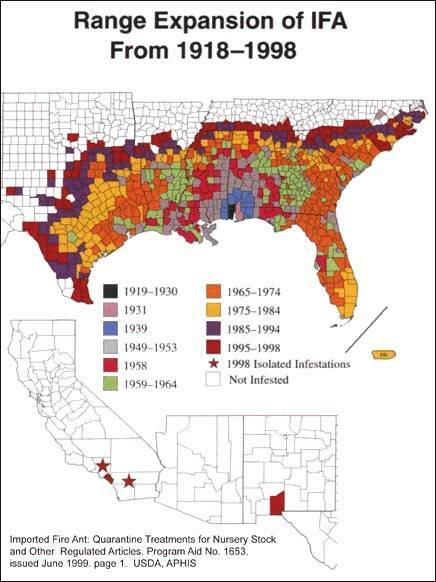 This map shows the area of imported fire ant infestation in the U.S. (Click on image to enlarge). Fire ants – known for their burning sting – are believed to have spread into the U.S. while aboard ships from South America during the 1930s. The ants populate an estimated 278 million acres in U.S. or about 11 states in the south and south east – and their numbers are growing. The ants are spreading uncontrollably because they have no natural predators in America. Lawrence Gilbert, professor of biology at the University of Texas, says the fire ant will spread farther into the U.S. if action is not taken to stop its invasion. The U.S. scientist is part of a research team that has introduced South American phorid flies into southern U.S. states in order to eradicate the fiery predators. By importing the phorid fly, scientists are hoping to introduce a natural predator that will help to put fire ant populations in check. In addition to wreaking environmental havoc, when a human is attacked by a fire ant, the venom burns like a hot match causing tiny blisters where the sting is given. 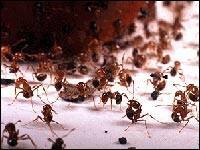 And because each fire ant usually stings repeatedly, victims can end up with hundreds of blisters all over their skin. Gilbert and his research team believe that the phorid fly is the best means to control the fire ant. The fly – which is also known as the decapitating fly – preys on the fire ant by injecting eggs inside the ant’s body. 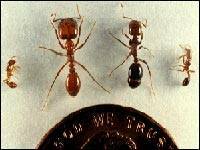 The injected egg develops in the ant for about 10 days and when the ant dies the larvae move into the ant’s head. The ant’s head then falls off and the fly larvae feed on the contents of the ant’s head until they develop into full-grown flies. The entire process takes about 45 days beginning from the time of the initial attack. So far the university has been releasing the Pseudacteon species of phorid fly to attack the fire ants. But scientists won’t know how successful the project is for several years. Another challenge to the phorid fly project is the long period of time it takes the fly’s eggs to become mature adults as well as the adult fly’s short life span, which is about three to four days. Gilbert says in order to establish a significant population of phorid flies they would have to release adult flies almost on a daily basis for about 40 days. Scientists do not believe that releasing the phorid fly will pose any significant danger to environment. They believe that the species that are being released are doing more good than harm. “As a scientist, I’m always hesitant to say there’s zero risk. But the minimal risk weighed against the cost of not doing anything propelled us into action,” says Gilbert. Since 1998, entomologists at Clemson University have also been trying to reduce the overwhelming fire ant population by introducing a naturally occurring disease as well as phorid flies into their colonies. Clyde Gorsuch, entomology professor at the university agrees with Gorsuch about the phorid fly project being extremely labour intensive. 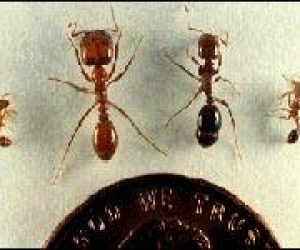 For more information on the fire ant wars check out University of Texas at Austin – Fire Ant Research Project website.